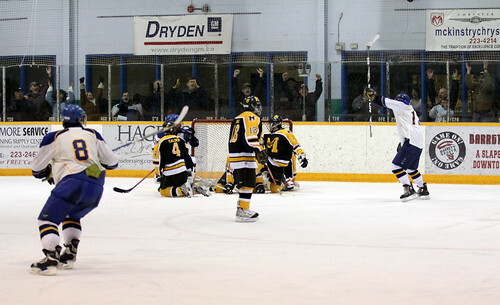 Ethan Egli celebrates along with Eagles fans after scoring the winning goal in overtime at the Dryden Memorial Arena Tuesday night. The Eagles Boys Hockey team handed the Fort Frances Muskies their first loss of the season tonight with a thrilling 5-4 overtime victory. The Eagles started off the first period with a hard forecheck , dominating the play as well as the scoreboard. Ethan Egli got the Eagles in the game with two goals in the first, at 10:34 assisted by Josh Reid and again at 19:49 assisted by Zack Pitchenese. However, the Fort Frances came back strong in the 2nd period and scored 3 unanswered goals to lead 3-2 after 2 periods. “We ran into penalty trouble in the 2nd period and our discipline was almost non-existent. We strayed off of our game plan and the Muskies capitalized.” said Coach Oltsher. In the 3rd period, Jeff Kropelin tied the game on a nice re-direction at 9:00 (assisted by Matt Bartlett and Ryan Lobreau), only to have FF restore their lead almost 2 minutes later on a breakaway. The Eagles kept applying pressure and it eventually paid off as Matt Bartlett scored to tie the game with 47 seconds left in the 3rd period and send the game into overtime. The extra 4 on 4 Sudden Death Overtime ended at 2:37, as Ethan Egli completed the hat-trick on a scramble infront of the Fort Frances net. Egli had just missed on a breakaway of his own but stuck with it and didn’t hesitate to bury the second opportunity on the backhand when it presented itself. The coaches were very impressed with the “never-give-up” attitude displayed in the final period. “The boys never quit and returned to the game plan from the first period.” said Coach Oltsher, “We have told them all year that if they work hard and stay disciplined, they can compete with teams like Fort Frances…hopefully they learned this lesson after the great effort they put forth tonight”. Zach Lake took the win in net for the Eagles. The Eagles now break for a week for exams but continue their season on Tuesday February 2nd as they host the Kenora Broncos.